bar food | Season It Already! Posted on December 5, 2013 by Carrie @ Season It Already! After our venture to Fulton Brewery, we sought out a bite to eat. We decided to drive around until we found something. We had nothing planned, so it would be spontaneous! This sometimes backfires when we I can’t may up our my minds. We drove around and less than a mile away we passed the Smack Shack. Do you know how many times we’ve seen this place online and in local magazines?! We’ve heard rave reviews about their food truck and particularly their Lobster Roll. We got out of the car and made our way over the block and a half to the Smack Shack. On our way, we walked passed Cuzzy’s. Oh no. Decisions, decisions. I made Rob choose. It was, after all, almost his birthday. He said we’d start at Smack Shack. Maybe we’d hit Cuzzy’s, too. He wanted to check both boxes. Smack: (Eastern U.S.) : fishing vessel, especially one having a well for keeping catch alive. Okay. That totally makes sense now. No wonder they are known for their lobster rolls. The funny thing? I wasn’t in the mood for seafood. I have no idea why. Maybe it was because it was 7pm and I last ate at 11am and felt like I was just famished. I was also indecisive. I can’t tell you how long we looked at that bar menu. They had a small handful of beers on tap, including the local Fulton we had just visited a few blocks down. I do love that in Minneapolis, restaurants are great about serving the beers from their local community! But at that point, I chose a Sparkling Sake instead. Why? Because I saw it on the menu and I had never had one before. It was low in alcohol. Then we ordered a couple of small plates. There are no words to describe how good these are! The beef is tender and the flavors are so well integrated and balanced. 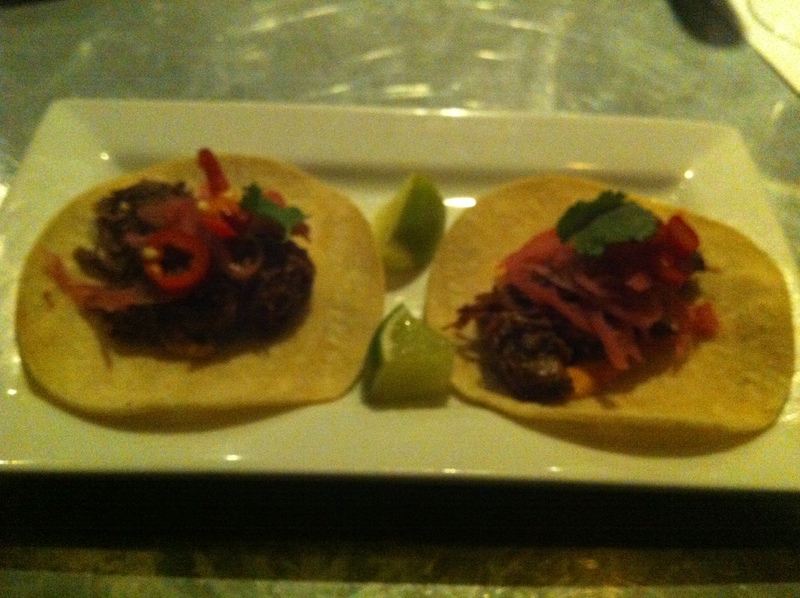 When we raved about them, our bartender said that the smoked pork tacos were even better. We couldn’t even imagine that was possible! 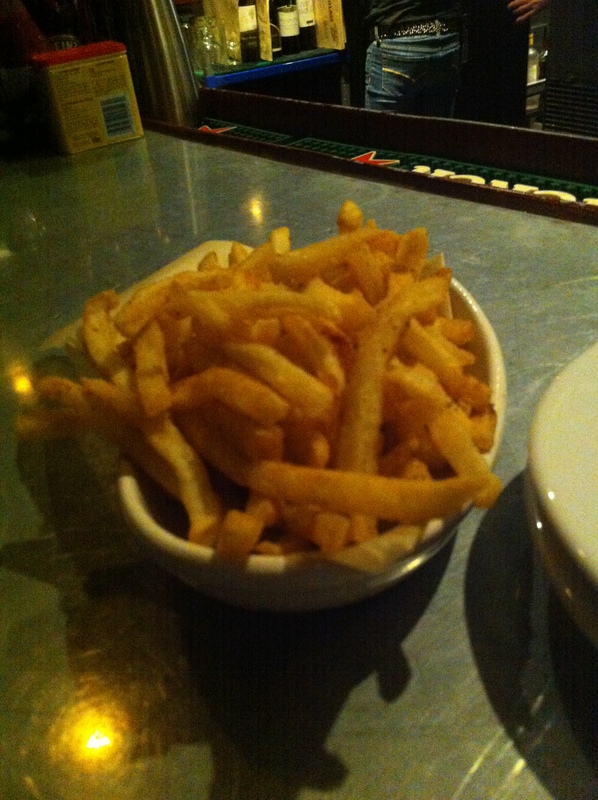 The fries were pretty good, but nothing to completely rave about. We didn’t finish them, especially since this was the point when Rob admitted that he wanted to go to Cuzzy’s, too. We agreed that we’d go back to the Smack Shack, especially if we have people in town who love seafood! We walked into Cuzzy’s knowing it was going to feel more like a bar than a restaurant. And with that comes bar food. There were dollar bills all over the walls and ceiling, but nothing like McGuire’s in Pensacola, where we hosted dinner after our beach wedding. It was the first time I realized why Fulton named their blonde ale the Lonely Blonde. A guy walked in, sat down at the bar and said, “I’d like a Lonely Blonde, please.” People are ordering Lonely Blondes all over Minneapolis! Clever. And I hadn’t even realized it until I heard someone order it. We opted for a burger and tots to split. I never expect this when we mention that we are going to split something, but they split it in the back for us. Never, ever expected, but always appreciated! 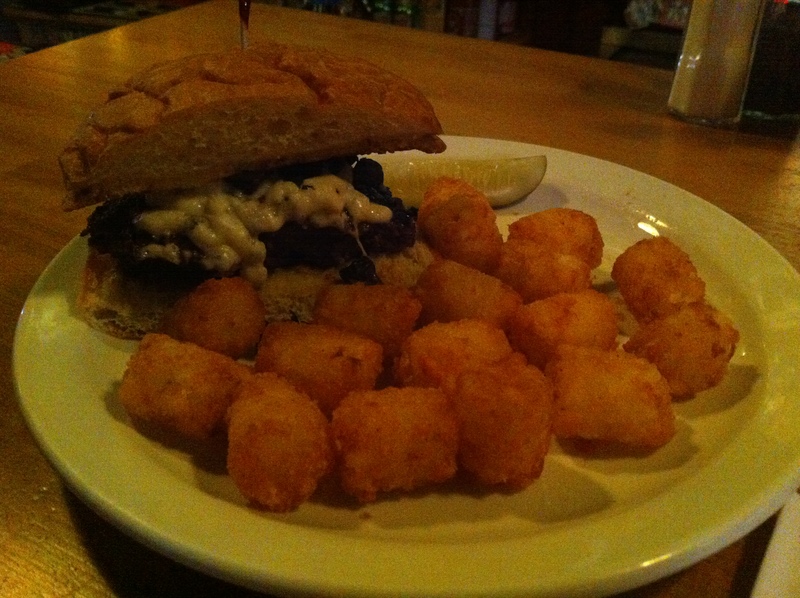 This burger was excellent and hit the spot! I can’t even begin to explain how perfect those portobello mushrooms were. The flavor was well balanced with just the right amount of seasoning and blue cheese. And although I was no longer hungry after we polished off our burger, when the gal next to us ordered a Mexican dish, I turned to look at it because it smelled so good! It looked fresh and yummy, too, not just slopped on a plate like you find some version of Mexican food. Looking for bar food in the Warehouse District of Minneapolis or close to the Twins’ Target Field? I think you’ll be satisfied here. Maybe even impressed. We were. The cuisine at Smack Shack and Cuzzy’s is completely different. Some would say that Smack Shack’s food is a bit more elevated; but for bar food, I’d probably say the same about Cuzzy’s. In my opinion, while different, they are equally enjoyable. We’ll be back to both! The problem will be choosing which one. Maybe it will be depend on our food mood. But if we can’t decide, we just might have to flip a coin. What are your favorite types of small plates? What kind of food do you like to split?